Explore historic Saint Paul’s Chapel and see the pew where George Washington worshipped and learn how the church served as a beacon of hope during two of New York City’s worst disasters. 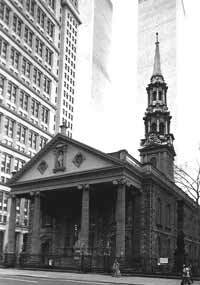 Built in 1766, St. Paul’s is New York City’s oldest continuously used public building. It is a parish church of nearby Trinity Episcopal Church, which is one of the world’s wealthiest churches (find out why on your NY See It All! Tour). In September of 1776, when New York City was a newly conquered British military garrison, a fire broke out at the southern tip of Manhattan and rapidly spread northwest, consuming everything in its path, including Trinity Church. St. Paul’s was narrowly spared from destruction by the heroic efforts of a bucket brigade. The fire destroyed nearly a third of the city’s housing, and Saint Paul’s became a refuge and relief center for hundreds of needy New Yorkers – a role it reprised in even more dramatic fashion 225 years later. New York was the nation’s capital from 1788 to 1790, and St. Paul’s was the church of preference for many of the United States’ founding fathers, including George Washington. They appreciated that Saint Paul’s was designed as a “Chapel-of-ease,” an intimate space intended to be comforting, not awe-inspiring. Washington attended a special service at Saint Paul’s on the day of his inauguration as the first President of the United States, and was a regular parishioner until the nation’s capital moved to Philadelphia. We’ll see Washington’s original church pew and next to it discover a national treasure that few New Yorkers know exists! Saint Paul’s is directly across the street from the former World Trade Center site. Amazingly, the church did not sustain even a broken window when the seven enormous buildings collapsed on September 11, 2001. In the chapel’s graveyard we’ll discover the reason for this remarkable occurrence. Your OnBoard New York tour guide will walk you through this fabulous Chapel (time allowing) and tell you more of its history and show you several interesting aspects of St. Paul’s Chapel.